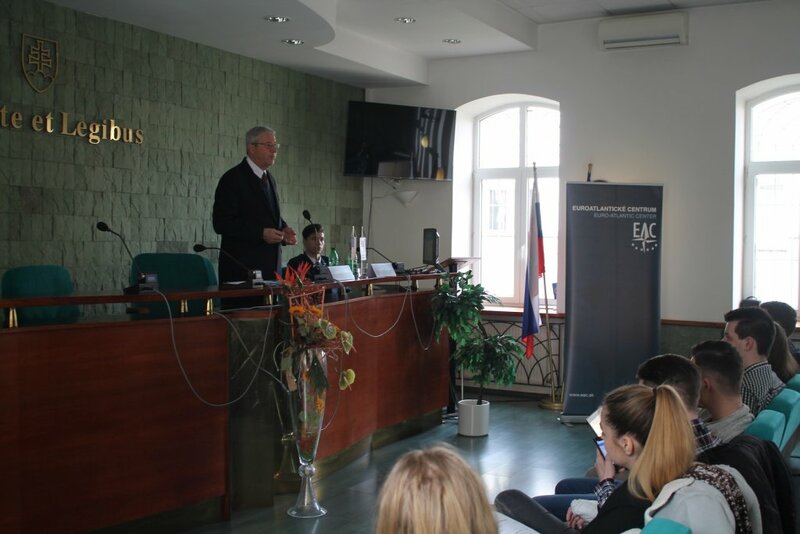 On March 27, 2018, the Euro-Atlantic Center organized a lecture on the topic of “NATO in the 21st century” at the Faculty of Political Science and International Relations of the Matej Bel University. Speaking at the event was Dr. Schuyler Foerster, US security expert and founding principal of CGST Solutions, a consulting firm specializing in national security policy and civic education. Dr.Foerster began by pointing out why NATO is so important for us, especially nowadays, which he followed up by briefly describing and summarizing the history of the Alliance. NATO was created as a unique political and military alliance, which was successful during the Cold War, but its success did not stop there. Since then, the Alliance has adapted to a new, modern world. The experience of two World Wars and the destruction they’ve caused was the leading impulse that ultimately led to its inception in 1949. As the Alliance gained on influence and importance, it steadily expanded – together with its newest member Montenegro, NATO currently has a total of 29 member states. 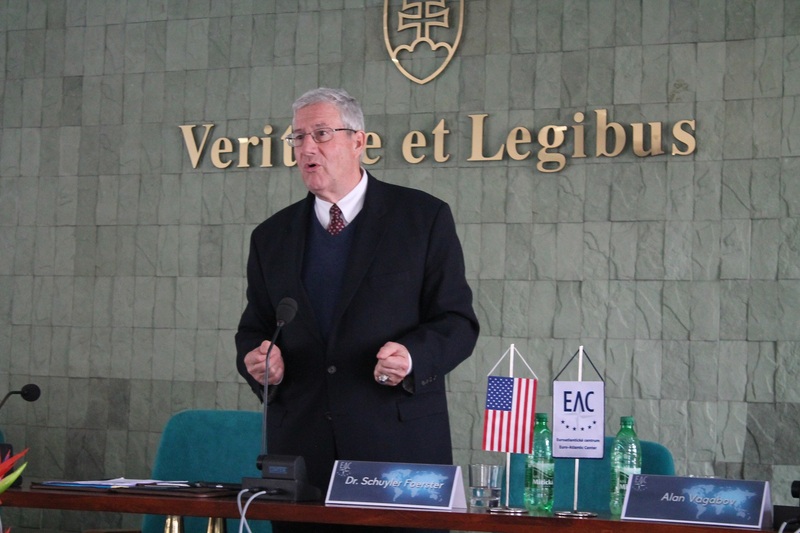 Moving on, Dr.Foerster touched upon the Alliance’s collective defence mechanism – Article 5 – explaining that invoking it doesn’t mean that NATO member states would start to wage war. Invoking Article 5 means that the Alliance and its members will take measures and do everything necessary to protect each other. After 1990 and the disintegration of the Soviet Union, NATO created a partnership for peace for all post-Soviet countries, which expressed their desire to become a part of the West. Despite objections from Russia, countries must be freeto decide, where they want to belong. An example of the formal invoking of Article 5 was in the aftermath of the 9/11 terrorist attacks. During the first decade of the 21st century, NATO was focused on Afghanistan, cyber-attacks and counterpiracy. Dr.Foerster mentioned that by the end of this decade, it seemed that the security threats to Europe started shifting from external ones to internal ones directly within it, with threats of terrorism from failed states also becoming a significant concern. Currently, the priority of the Alliance is to insure that no conflict turns into a hot war, because none of us can afford that. Active security threats include those to civilian infrastructure, to our information systems through cyber-attacks, through disinformation and efforts that weaken our political institutions. In today’s complicated, ever-changing world, the message to NATO members and the Alliance in general should be to go back to the basics, as collective defence remains the best answer and option for Europe. Fielding questions from the audience, Dr.Foerster stated that he thinks the recent Novichok chemical attacks in Salisbury could potentially lead to NATO countries invoking Article 5, should the British government be willing to do so and take it there, yet the response is going to be a political one, not a military one. In a political alliance, in which allies stand with each other, there should be no tolerance ofbehaviour like this, as this is a violation of international law. Answering a question about the technological progress the Alliance has made, Dr.Foerster explained that NATO had to face and deal with technological advancements of epic proportions. We have created a technological society, in which we are vulnerable to so many things we can’t even imagine, but luckily, these non-military attacks can be prevented by educating citizens and by carefully selecting credible information. 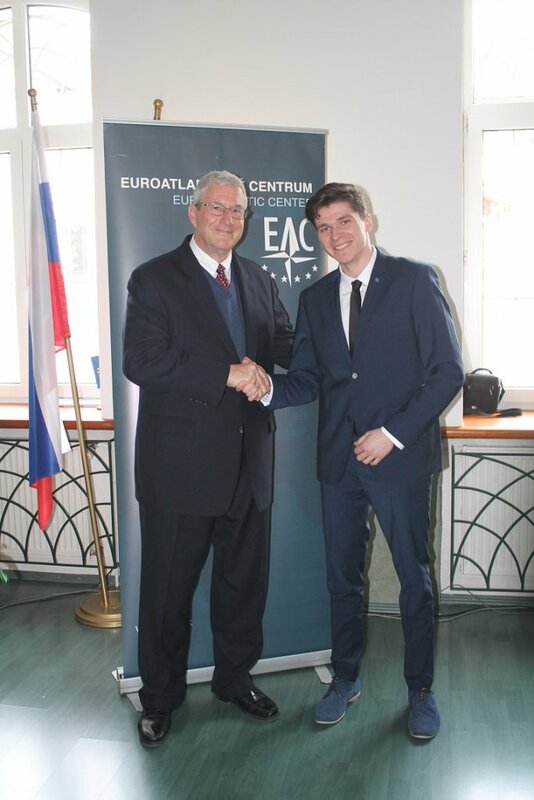 The Euro-Atlantic Center would like to thankDr.Foerster for his insight and expertise, as well as the US Embassy in Slovakia and the Ministry of Foreign and European Affairs of the Slovak Republic for their help in organizing the event.